As well as producing various rules and scenario books throughout the year, Too Fat Lardies produce a bi-annual special in PDF format which contains all sorts of articles written by players of ‘Lardy’ games in support of the hobby. 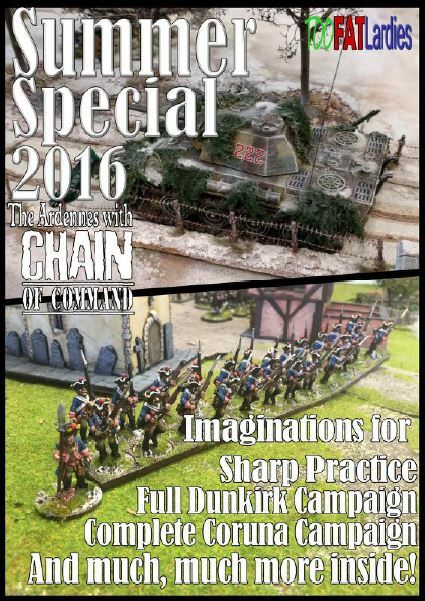 These range from one-off scenarios through to mini campaigns, discussion of tactics for an army, period or game thoughts on how to play a particular period using a set of rules. The content of these specials can be diverse, and this one is no exception. It covers rules such as Sharp Practice 2, Chain of Command and I Ain’t Been Shot Mum, but also Charlie Don’t Surf and Bag the Hun. Conflicts range from World War II to Indian Mutiny, Vietnam to the US-Mexican War, The 6-Day War to the Napoleonic Wars and beyond. There is a huge amount of material crammed into a single PDF document: 136 pages worth in this instance. Whilst all the campaigns and scenarios are geared towards Too Fat Lardies rules, they can be easily adapted, so this publication has a wide use outside of the immediate TFL community.